Based on the attractive theme of evolution, Net Entertainment’s (NetEnt) Evolution slot challenges players to win scatter prizes of up to x100, a top fixed jackpot of 500 coins, and plenty of cash prizes in its special evolution feature and free spins round. NetEnt’s Evolution slot comes with 25 fixed paylines, which means that players need to play all the paylines. However, they can bet anywhere in the range of one to ten coins per active payline. They can also choose from a coin value range of $0.01 to $0.50, which makes the max bet $125.00 per spin of the reels. Once players have placed their bets, they can hit the Spin option and set the reels spinning. If a winning combination appears on the reels, they can collect a payout based on the game’s payout table. Otherwise, they can place another bet and try again. Like all NetEnt slots, Evolution comes with a Skill Stop Feature that allows players to stop the reels in mid spin to grab a winning combination. Players can also use the Autoplay feature to spin the reels automatically. 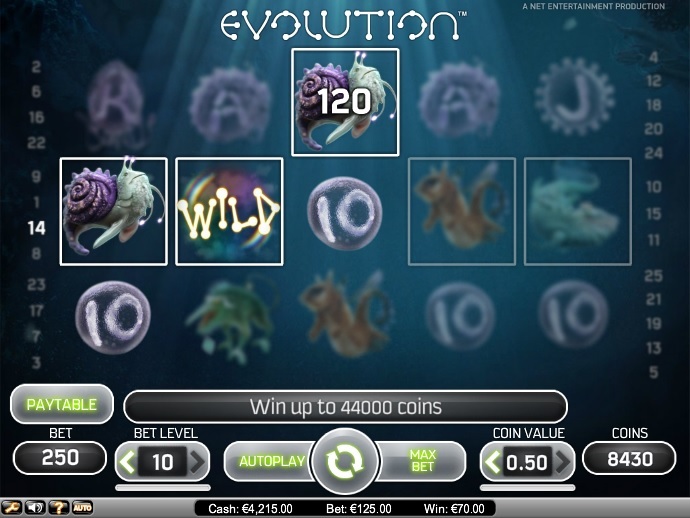 Playing NetEnt’s Evolution slot is an exciting way to learn all about the evolutionary process. Although the theme is serious, the slot can offer entertainment and prizes unlimited. The reels feature icons of strange creatures in various evolutionary stages. Some of these are the Draconius Rex, the Basilisk Hairicus, the Basilisk Pluma, the Albus Slugus, and the Bestia Dentum, along with high-value card icons. The symbol of a bubble with the word “WILD” written on it acts as the wild, but it appears only on the second, third, fourth, and fifth reels. Players should note that the Wild icon will not help them activate the free spins round as it cannot substitute for the scatter symbol. Players need to land at least three scatter symbols anywhere on the reels to activate the free spins bonus round. Players can win 10, 15, or 20 free spins for landing 3, 4, or 5 scatter icons, respectively. The only downside is that players cannot re-activate the free spins bonus while playing a free spin. The Evolution Feature gets activated in the free spins round whenever players spin a winning combination. The creatures forming part of the winning combination evolve to the next level to give players another fabulous payout. For example, if players create a winning combination of Ten symbols, they will evolve to the Jack symbols and this continues till the Ace symbols are reached. Evolution is worth playing for its lucrative features and unique theme. The slot, with its smooth game play and attractive animations, is available for fun as well as real money at any online casino that operates on the NetEnt software platform.